Where making peace with the pieces doesn't have to be a compromise, where deprivation becomes joy, and Eating To Live is my true preference! Welcome to my impossible world, I am Jemoiselle and this is The Blissful Nutritarian. Hello to you dear readers, how have you been this year? I've never felt better! I'm so excited to write this post, because I have a new favorite food to share with you! So many of the blog posts I read (and write) focus on recipes, and from what I can see, that is what people want, even need. But honestly, I don't live like that. I don't follow recipes, I wouldn't thrive within a lifestyle that required that of me in order to achieve success! I thrive on a genuine admiration of the foods that love me back just the same, and I cannot wait each and every day to get my hands dirty and play with them! Yes! That's right. You heard me. I play with my food! I think everybody should! It brings my life such immense pleasure in doing so. Most of the food I eat is as simple as unpeeling it, cracking it open, and diving in spoon first. With that in mind, I want to share with you a little more of me. 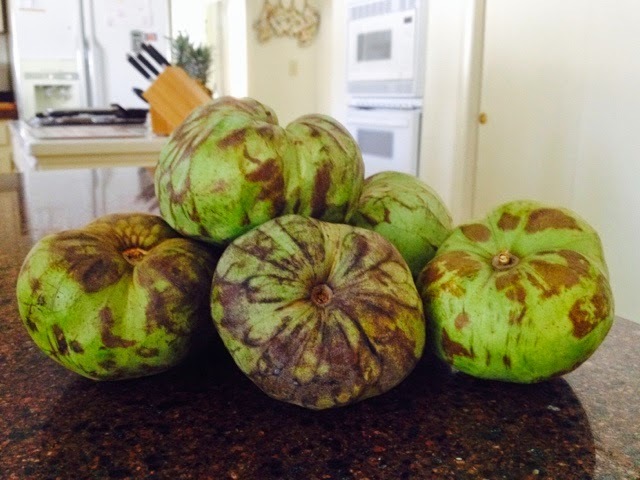 Meet my newest passion, the Custard Apple! It is, officially and unequivocally my favorite food on planet Earth. Hands down. Bar none! Despite my apprehension I really was so thrilled to have an opportunity to try them! I really was grateful. In the back of my mind, I was terrified of not liking them, of wasting them. Rare (for the typical American market) tropical fruit is usually not cheap. I always worry about wasting his money, do you get like that when you're shopping too? Thoughts of my experience with a particular spinet melon come to mind. Shudder! You see something you would love to try but are too afraid you won't like it, and the thought of it in the garbage combined with the price scares you off! I'm sure it's not only me! Exactly. Well, one of my new goals on this blog is to help you through that, to show you unique and rare fruits and veggies too, inside and out, using the Creator's recipe as my guide. I want to teach you to cut it, how to eat it, when its in season, how to pick one (or ten!) out and try my best to describe its flavor so you can widen your food horizons! Without further ado, please feast your hungry eyes on this beauty! The Custard Apple, or Cherimoya is the fruit of the Annona Cherimola tree in the Annonaceae family, also known as the sour'sop family. I hope I'm getting that right? Ha! Many trees of the same genus make similarly named fruits, making the actual fruit I have here possibly confusing to find. To save yourself from confusion, you'll want to see the name "Cherimoya" on the little fruit sticker to verify you have the one I am featuring. 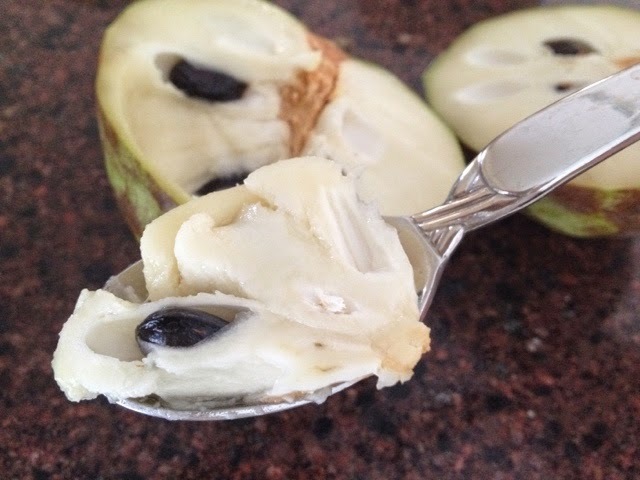 The Cherimoya is grown primarily in South America, and was originally called Chirimuya by the Inca people who were lucky enough to have lived in the Andes where it grew naturally. Other English names followed, to include Chirimoyo, Momona and Kelemoio to name a few. The fruit ripens in the winter to spring, when it is at its peak. The ideal fruit will be baseball sized or larger, slightly heart shaped, a rich green hue, with mottled darker patches. The skin will have a scale like appearance, and smell deeply of musk, almost to the point of being off putting for some. Feet! Hehe. That's how you know you have a good one! It should feel soft in your hand, like a very ripe pear. 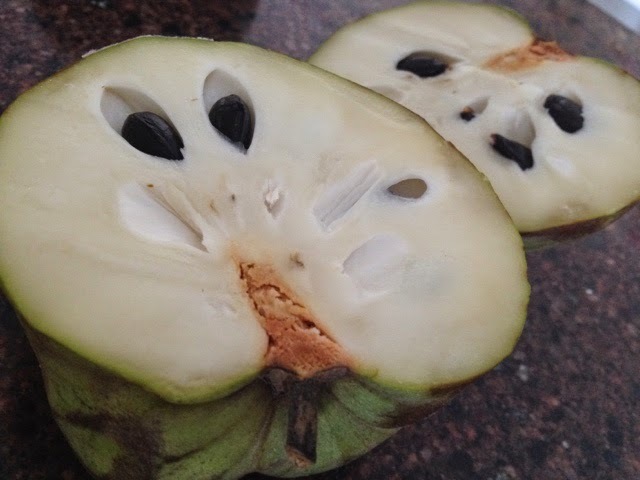 Don't be afraid of a soft cherimoya! That is where the custard texture comes from. The fruit is ripe even when firm, with the darkened patches, and still delicious, but the truest decadence is experienced when you allow it to fully ripen into a rich creaminess you'll be sure to crave long after they go out of season. The fruit is cut in half, and served on a plate in my house, with a little side dish for spitting out the large smooth glossy seeds inside. Yes, you have seeds to spit! Trust me, being one who usually rejects fruit that has seeds that need that kind of treatment, I find this fruit more than worth it's trouble! The white flesh is delightfully sweet, rich and creamy and reminds me of a floral vanilla custard, with beautiful nuances of pineapple, mango, and fresh palate cleansing apple on the finish. So many layers, like a fine wine. Ahhhhh. Unfortunately, I discovered these bad boys just as the season was coming to an end, so unfortunately unless you are very lucky, you and I will be waiting until next winter to find them again. Kind of tragic, no? But at least now you have them in your mind, and the next time you are lucky enough to see them, you will know exactly what you must do! They might not be completely gone! There might still be time. Have you seen them in your market? If so, go out and grab one! Or two! Or a case!! Enjoy, and think of me. Hi, I'm Jemoiselle! 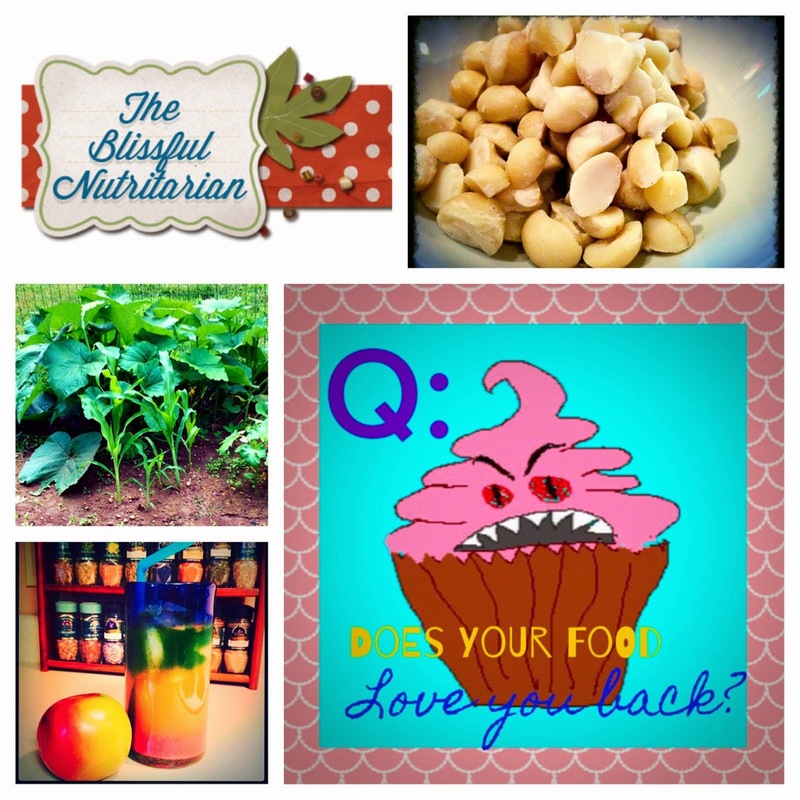 Welcome to The Blissful Nutritarian! I've been a practitioner since April 2009 and have never felt better! It has flat out rocked my world! After healing my body through plant-based nutrition, I want to shout it from the roof tops! Food is medicine and "healthy" food can be just as crave-worthy as junk food if you give your body a chance to adjust! I love to help others who wish the same for themselves! If that's you, contact me though youtube or my form below anytime. I'd be happy to help! Need Help? Have a Q? Idea? Contact Me! Links That Will Change Your Life! No, make THESE Nutritarian Cookies! Oooh BABY! Just Like Campbell's Tomato Soup: Nutritarian Style! My Secret Weapon Series: Coming Soon! 'Tis The Season: Nutritarian Baked Apples! Warm Apple Crepes for Breakfast! "Where making peace of the pieces doesn't have to be a compromise, where deprivation becomes joy, and "Eating to Live" is my preference. Welcome to my beautiful world! I am Jemoiselle, and this is The Blissful Nutritarian."